The Sig P229 has a very interesting history and is directly tied in with the Sig P228 history. The P228 was an outstanding seller for Sig and, when the S&W .40 caliber round came to the market in 1994, Sig had planned on chambering the P228 in that caliber. However, testing of the caliber in the P228 indicated that the slide on the P228 wasn’t strong enough to handle the increased pressure and power generated by the .40 caliber round. 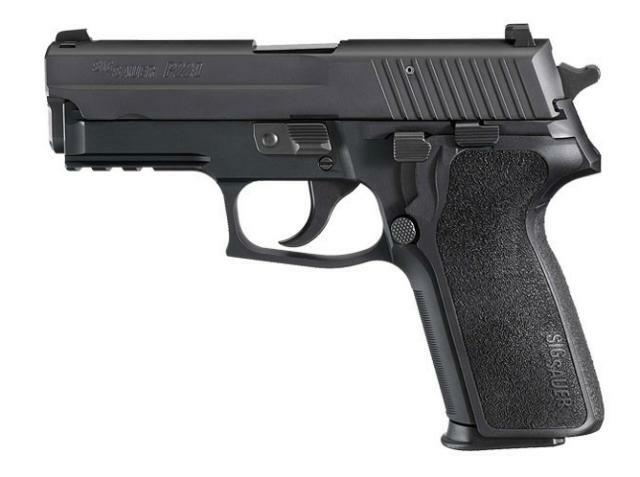 Sig designers felt that the .40 was going to be an extremely popular round, especially in the LEO and self defense markets, so they had to act quickly to get a P228 variant in .40 caliber to the market. Scroll down to see all the Sig P229 holster models that we carry. The P228 slide was manufactured from forged carbon steel and that that seemed to be the weak point in the transition to the 40 caliber. Originally, Sig considered just retooling and offering a milled stainless steel slide on the P228, but that could have potentially caused issues as the existing recoil spring would have to upgrade in strength as well. Rather than go down that path, Sig opted to mate the milled stainless steel slide to a P228 frame, and introduce a new model entirely. The milled stainless steel slide was strong enough to handle the .40 caliber round and the up and coming Sig .357 round that was in development at that time. Sig decided to name the model the P229, and it was introduced to the market at the 1991 SHOT show. The P229 officially went into production in 1992. For the first two years, the P229 was only available in the S&W .40 caliber. When the .357 Sig round was introduced in 1994, the P229 was the first pistol on the market to be chambered for it. In 2005, Sig began offering the P229 in a 9mm version as well, and phased out production of the P228 later that same year. Currently, the P229 is only offered in 9mm, S&W .40 caliber, and the .357 Sig caliber. Like most all of the classic Sig P series weapons, the P229 uses the same operational controls as the P228 and P226. The early model P229 versions were not equipped with a picatinny rail, but it was introduced into later models, and is standard issue on all P229 models currently manufactured. Originally, Sig was using a proprietary Sig rail on the P229, but switched over a mil-spec 1913 picatinny rail system in 2012. Most all P229 models are DA/SA (Double Action/Single Action) only, but Sig is now offering a Legion variant in a SAO (Single Action Only) version, and a DA only version called a DAK version. The DAK acronym stands for Double Action Kellermann and is named after the trigger inventor. The P229 has been a monumental success for Sig with both widespread law enforcement and civilian adoption in the US and abroad. #1 – Will the P229 fit in a holster made for the P226 or P220? Most likely, but that can vary depending on the when the holster was produced, and if it was molded for a P226 or P220 with rails or without. A holster made for a non-rail P220 or P226 won’t fit a railed 229 all that well. However, a holster made for a railed P220 or P226 will fit a railed or non-railed P229 just fine, but you’ll have about an inch of surplus holster. #2 – I have a P229R but don’t see that many holsters for it. Do you offer a holster to fit this model? The P229R is just a basic P229 with a rail. The early P229 models didn’t have a rail, so when Sig introduced the rail on the P229, they called it a P229R. Most all P229 models produced since 2009 have an integrated rail of some sort, so Sig has dropped the “R” designation off the model names. #4 – I have a Sig P229 variant called a Sig M11-A1 Compact. Do you offer any holsters to fit that model? Although Sig lumps the M11-A1 in as a P229 variant, it’s actually an updated version of the Sig P228 M11. The M11-A1 was introduced to the market in 2012, and is P228 frame mated to a newer P229 slide. If you are looking for a holster for this model, visit this page: Sig M11-A1 holsters. #5 – I have a Sig P229 in .357 Sig, but can’t find any holsters specifically marked to fit the .357 version? Why is that? Although the P229 is available in 9mm, .40 caliber, and .357 Sig versions, all 3 versions of those calibers are basically the same size. As such, all will fit into a holster made for any P229 caliber. It isn’t necessary to be specific on the caliber as a holster made for a Sig P229, will fit any P229 regardless of the caliber. #6 – Will a P229 fit in a holster made for the P228? Contrary to popular belief, the P229 and the P228 don’t have the exact same dimensions, with the P229 being just a hair wider (due to the milled slide). However, the size differences are so minute, that most holster makers lump the P228 and the P229 into the same fit. However, most holster makers also mold holsters for the P228 and P229, off a railed P229 mold. If they used a true P228 mold, the P229 might not fit as the P228 is not railed, while the P229 has a rail. Any of the holster models listed below are available in a version to fit the P229 and most P229 variants.